Autumn with you today to share a springtime mixed media tag with our lovely new Fluttering Butterflies die. I cut a tag from watercolor paper and cut two of the butterfly dies. I sprayed my tag with Lindy's Stamp Gang inks to give it soft color. I embossed a dots stamp with shabby pink Frantage embossing powder. Then I stamped text randomly in grey ink. My base butterfly die was given a coat of texture paste with some fine Art Stones mixed in and then colored with the sprays. I fussy cut the butterflies from my second cutout and layered them for dimension. This gave some relief to the busy design, but still allowed the texture to show in the lower die. I layered them over a torn strip of cheese cloth. 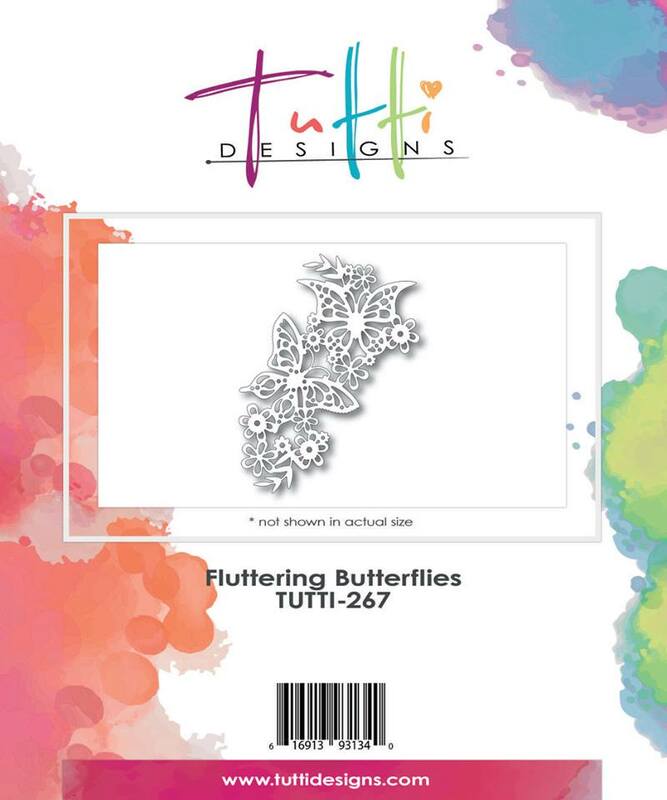 Purchase your Fluttering Butterflies die today HERE! Such a lovely spring tag from Autumn! I love the soft palette of the background and the subtle texture on the die cut. Just so pretty! What a gorgeous tag and awesome texture ideas! Love the beautiful spring color palette! Fabulous! Such a pretty and very interesting background. The frantage is gorgeous and adds lovely interest. Love how you have given a coat of texture paste, with some fine Art Stones mixed in and then colored with the sprays on the butterfly underneath. Love this idea and will be giving it a go. The colours are fabulous on your tag, absolutely love it x. Thank you for sharing how you made this beautiful tag, Autumn! Your gorgeous designs are always so inspiring...hugs!! A Tutti Crane, Just for You. Black and Gold Ginger Jar. Going Oriental with a Pagoda.